In 1966, Senator George Aiken returned from a trip from Vietnam with the recommendation that the United States “declare victory and bring the troops home.” It’s a very different context, but I’m inclined to give the General Assembly similar advice: Finish the work on the bipartisan budget, declare victory, and go home. In 1966, Senator George Aiken returned from a trip from Vietnam with the recommendation that the United States “declare victory and bring the troops home.” It wasn’t entirely clear that the U.S. had won the war at that point, but we also hadn’t yet lost the war (as we would after another eight years of suffering and death). It’s a very different context, but I’m inclined to give the General Assembly similar advice: Finish the work on the bipartisan budget, declare victory, and go home. Last year, an appropriations bill that implements the bipartisan budget framework, SB1073, passed the Senate by an overwhelming vote of 43-7. It was one roll call vote short of passing the House in December, having already been approved by a narrow, yet bipartisan, majority on second reading. The General Assembly should return to that bipartisan approach now and then enact the taxes we need to fund the budget. Not everyone will be happy. But that’s what happens when politicians make a deal. At the very least, the General Assembly would be spared any further ignominy for its inability to carry out one of the most basic functions of state government enacting a balanced budget. Back in November, I said the Republicans should meet Gov. Wolf half-way. 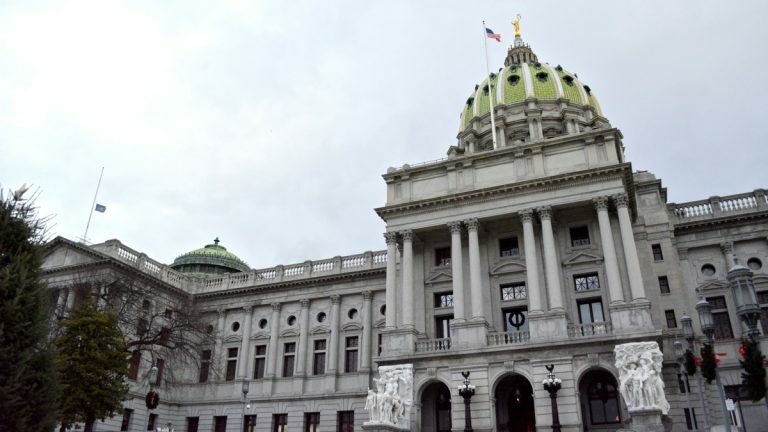 The recent Pennsylvania Budget and Policy Center brief shows they almost did. The bipartisan budget deal was a genuine compromise. The overall spending level in the compromise bill is $30.8 billion, almost exactly midway between the governor’s budget of $31.3 billion and the Republican budget of $30.25 billion. The governor proposed total Pre-K-12 education funding of $11.5 billion. The Republicans proposed $10.7 billion. And the budget compromise proposes $11.0 billion. And one find compromises on funding levels in other areas. The Republican-controlled General Assembly and the Democratic governor share responsibility for the budget. So one would think that, having reached an agreement that splits the difference between them and has passed the Senate, it would be possible to pass it. Some say that there could be no budget agreement because “reforms” of the pension system or the Liquor Control Board have not been enacted. Senate President Joseph Scarnatti was quoted as saying that, without them the Republicans have gotten “nothing,” indicating what one Republican leader thinks about the value of new spending for education or human services. Strictly speaking, Scarnatti is wrong. The Republicans got substantially lower spending than Gov. Wolf has proposed. Moreover, why hold the budget hostage to legislation on pensions and the LCB that have no immediate budgetary impact? If Republicans want to enact legislation on these issues that implement the framework, they have the votes to do so, and the governor has promised to sign it. Some Republicans have complained that few Democrats voted for pension and liquor legislation. But no one really expected them to do so. Most House Republicans voted against the compromise appropriations bill, and most Republicans will vote against the revenue bill needed to balance any budget. Bipartisan compromises often require one party to provide most of the votes for one part of the deal while the other party provides most of the votes for another part. Moreover, the problem with pension reform in the House was not the Democrats but the Republicans who voted no. Right-wing Republicans turned against their own pension bill, it seems, to have an excuse for breaking the agreement on the budget. Their action reminds me of one definition for the Yiddish word “chutzpah” — killing your parents and then seeking mercy because you are an orphan. Then there is the Republican fear of taxes. Majority Leader Reed said that “we’re not going to increase taxes by billions of dollars.” But the Republican budget, no less than the governor’s budget or the bipartisan budget, requires new revenues this year. Everyone who has looked at the budget honestly — including the conservative Commonwealth Foundation — understands that, even if there were no new spending, there would be a structural deficit of roughly $318 million this year and $1.8 billion next year. Given that the legislatures under both Rendell and Corbett cut corporate taxes by billions, some taxes must go up now if we are going to avoid a catastrophic reduction in spending on education, health, human services, and everything else. And some Republicans understand what is at stake and are ready to vote to raise taxes. The time to do it is sooner rather than later. And that’s why I’m a bit hopeful that sometime after Feb. 16, when Republicans can vote for a tax increase without stoking a primary challenge, they will join Democrats in declaring victory — perhaps on a two-year budget — and then go home to face a general election with a genuine compromise budget. The only alternative is to face the voters next while dreadful budget cuts go into effect.